Jen Psaki the latest Obama spokesperson to stutter an explanation as to why he described the attack on kosher store as just 'random'. Not anti-Semitic - just random? It's the controversy that just won't go away - and it's hard to understand why. Since US President Barack Obama's controversial comments during a recent interview, in which he downplayed the anti-Semitic nature of the deadly shooting attack at a kosher supermarket in Paris last month, government spokespeople have been falling over themselves to explain what exactly he meant. And failing pretty miserably. In the interview with Vox, published earlier this week, the US President asserted that the media was "overstating" the threat from terrorism to garner ratings, but admitted terrorism was still a problem. In so doing, however, he provoked a storm of controversy with the following comment: "It is entirely legitimate for the American people to be deeply concerned when you've got a bunch of violent vicious zealots who behead people or randomly shoot a bunch of folks in a deli in Paris." 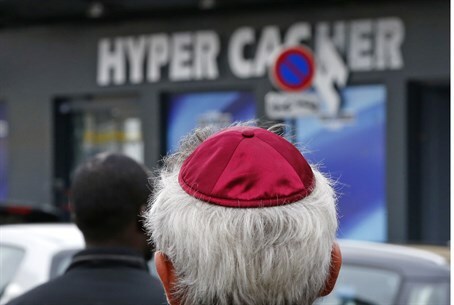 That statement provoked widespread outrage, with viewers taking to social media to ask how an attack by a follower of a virulently anti-Semitic ideology on a kosher store could be seen as "random," rather than as an attack against the Jewish community. First, White House official spokesman Josh Earnest made a valiant but cringeworthy attempt to tidy up after the President, justifying Obama's claim that climate change was more dangerous than terrorism, as well as attempting to explain how ISIS terrorist Amedy Coulibaly was simply "shooting random folks" without paying any attention to their background at the Hyper Cacher store. Later Tuesday evening it was the turn of State Department spokeswoman Jen Psaki, who similarly struggled to rationalize Obama's strange comments. Associated Press journalist Matt Lee began the exchange, asking: "Does the administration really believe that the victims of this attack were not singled out because they were of a particular faith?" Psaki's response to the straightforward question was perhaps even more evasive than Earnest's. Psaki: "Well, as you know... I believe... if I remember the victims specifically, they were not all victims of one background or one nationality so I think what they mean by that is... I don't know if they spoke to the targeting of the grocery store... but (rather) the individuals who were impacted." When Lee pointed out that Secretary of State John Kerry's own actions, by meeting specifically with members of the Jewish community to pay condolences after the attack, suggested otherwise, Psaki struggled to formulate a coherent response. Psaki: "Naturally given that is... the grocery store is one that, uh..."
Lee: "But don't you think the store itself was a target?" Psaki: "That's different from the victims being..."
Lee: "Does the administration believe that this was an anti-Jewish... an attack on the Jewish community in France?" Psaki: "I don't think we're going to speak on behalf of French authorities and what they believe was the situation at play here..."
Lee: "But if a guy goes into a kosher market and starts shooting it up, he's not looking for Buddhists is he? "Who does the administration expect shops at a kosher (store)...? An attacker going into a store that is clearly identified with one specific faith - I'm not sure I can understand how it is that you can't say that this was a targeted attack!" Psaki: "I don't have more for you Matt, it's an issue for the French government to address." It is of course possible that the original comments by Obama were simply flippant, and not specifically intended to play-down the anti-Semitic motive of the attack. But the subsequent responses of two senior administration spokespeople such as Earnest and Psaki - whose jobs are to simply parrot the line of the US government - appear to suggest otherwise, raising some difficult questions. Why is the Obama administration trying so hard to play-down the anti-Semitic nature of the attack?